Plasma is also called the 4th state of the matter. The example of water: In the form of ice it is a solid state, supplies heat, so energy; the ice becomes liquid, with more energy supply, finally, gaseous. 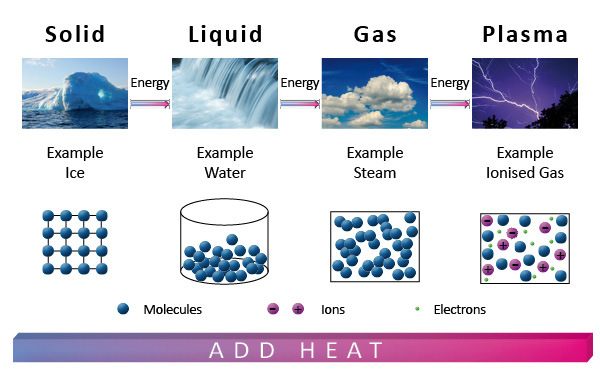 If even more energy is supplied to a gas, plasma originates. A state in which the gas atoms or gas molecules separate from their external electrons. In plasma the atoms or rather the molecules, ions (the atoms that lacks one or more electrons) and electrons move freely around and have an effect on each other at the same time. Plasma is an entire or partially ionised gas, which has a row of special qualities as an electro conductive medium. Matter in the plasma state is found in the sun and in all stars. There are even more plasma producers like the solar wind from the sun and the charged particles which are caught in the magnetic field of the earth. Technical plasmas are only partial ionised gases. They can have room temperature (”low temperature plasmas”) and the free electrons are extremely escharotics. Technical plasmas are indispensable tools in many industrial branches. Low-pressure plasmas can be generated artificially in a vacuum chamber, by putting out the gases to a high frequency magnetic fields and causes discharges. It comes to an ionisation of the gas with origination of free radicals and ultra violet radiation. In this manner a highly reactive gas is generated which comes into a reaction with the material surface (which subject to the processing).